When challenged to come up with a dish for Boston’s 2016 Bourbon & Bacon Fest this past spring, Worden Hall co-owners Dan Henn and Dylan Welsh went into the kitchen to experiment and emerged with this bourbon-and-hoisin-glazed pork bun (1) topped with pickled Napa cabbage, radish, carrot, and jalapeño. Not coincidentally, it’s a perfect match for the South Boston tavern’s portfolio of 150-plus whiskies—as are the curry-style smoked lamb ribs (2) with tomato, cucumber, feta, tzatziki, and kalamata vinaigrette. 22 W. Broadway, South Boston, 617-752-4206, wordenhall.com. What do you nibble on while drinking a mint julep out of a recycled soup can? If you’re at the Frogmore, the answer is crispy chicken skins (3), of course. This special late-night menu item at the Carolina-inspired haunt combines two perennial drunk-food favorites: pork rinds and hot wings. “There’s hardly any meat, but you get this nice salty, puffy skin,” says chef Kelly Marts. “It’s rich and decadent without seeming to be that heavy.” It gets even richer when you dip those skins into the accompanying pimiento cheese and aioli with Chackbay seasoning. Don’t forget your vegetables—how about the grilled okra (4) with smoked tomato jam, seared cipollini onions, and crunchy hominy? 365 Centre St., Jamaica Plain, 857-203-9462, thefrogmore.com. “Elevated bar food is what I made my name from at Drink,” says Garner Blume of his formative gig working in the kitchen of Barbara Lynch’s cocktail shrine. And that’s what he’s bringing to Belfry Hall, the soon-to-open sibling and neighbor to the Townshend in Quincy, as its executive chef. 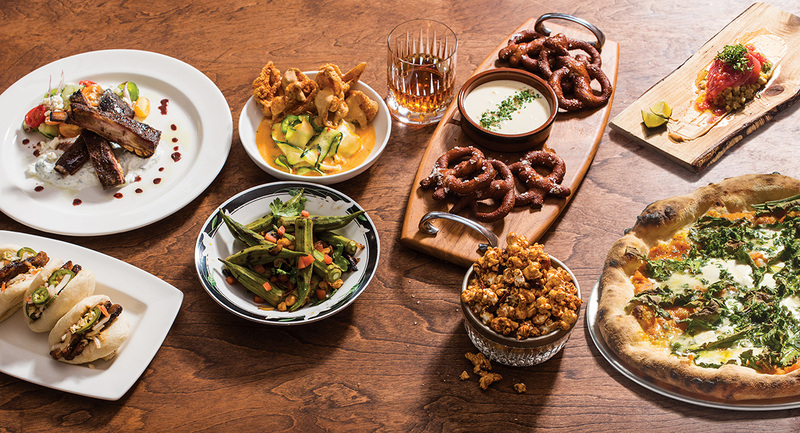 Blume marries European and U.S. beer cultures with his menu of communal plates: A fondue of aged Gouda and mimolette with house-made pretzels (5) conjures up a tavern in Bruges, while bacon-candy popcorn (6)—with North Country Smokehouse bacon from New Hampshire and a Frangelico-laced caramel glaze—is pure high-low Americana indulgence. 35 Washington St., Quincy, belfryhall.com. This Charlestown gastropub draws throngs with its thoughtful beer selection and exceptional food, served up in a cozy industrial-chic space. Chef John Paine works culinary magic with deft compositions of carefully selected ingredients and an 800-degree wood-burning oven. Take, for example, the charred-kale pizza (7) topped with red hubbard squash, local maple syrup, and Rogue Creamery cold-smoked blue cheese. Or there’s his riff on Mexican street corn: a raw tuna salad (8) that combines fresh corn, chicken-fat mayo, cotija cheese, lime, chilies, and cilantro. 7 Moulton St., Charlestown, 617-337-5703, brewersfork.com.